UNEDF is a collaboration of physicists, computer scientists and applied mathematicians using high-performance computing to explore the nuclear landscape. Point to the buttons at left to highlight computational sub-projects; click for details. Refresh for more. 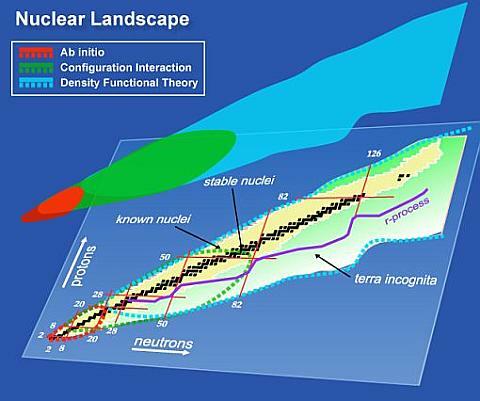 An article by current and former UNEDF researchers at the University of Tennessee and Oak Ridge National Laboratory describing our best theoretical knowledge of "The limits of the nuclear landscape" appears in the June 28 issue of Nature. The team of faculty, postdocs, and students led by UNEDF co-director Witek Nazarewicz used the Jaguar supercomputer at ORNL to solve state-of-the-art energy density functionals to establish, with error estimates, what combinations of protons and neutrons can form into atomic nuclei. These advances are also featured as a 2012 DOE Nuclear Physics highlight. 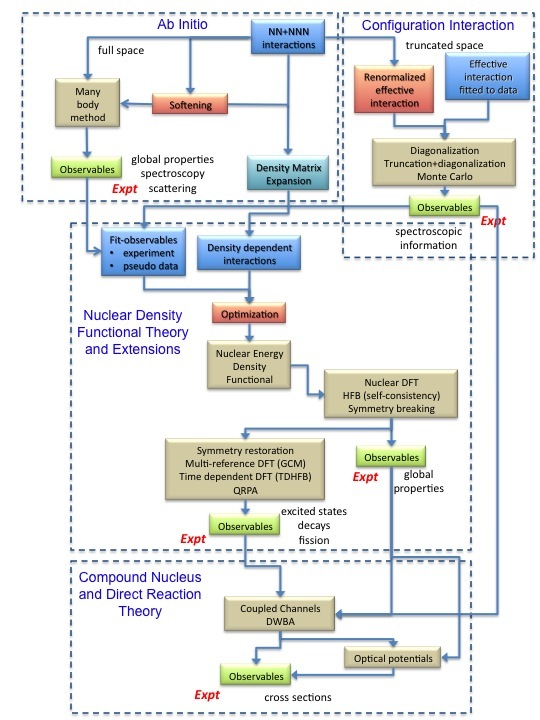 An article in the Stockpile Stewartship Quarterly for May, 2012 entitled "Quality Input for Microscopic Fission Theory", by UNEDF researchers Witek Nazarewicz, Nicolas Schunck, and Stefan Wild, describes a milestone energy functional that accurately predicts actinide fission barriers as well as global nuclear properties. This research by nuclear physicists at the University of Tennessee, Lawrence Livermore Naitonal Laboratory, and Oak Ridge National Laboratory, in collaboration with computational mathematicians at Argonne National Laboratory, is enabled through the SciDAC-2 UNEDF project and a Stewardship Science Academic Alliances grant. For the fifth straight year, the DOE INCITE program awarded a large number of hours for UNEDF computational nuclear physics projects, the sixth largest out of 60 awards for 2012. More details are available on the INCITE award and on UNEDF leadership-class computing in 2011. Dr. Stefano Gandolfi, a member of the UNEDF collaboration, has accepted a staff scientist position in the nuclear, particle, astrophysics and cosmology group in the Theoretical Division at Los Alamos National Lab. Stefano will work on nuclear theory. Congratulations to Stefano on his new position! Witek Nazarewicz of the University of Tennessee, Warsaw University, and ORNL has been awarded the 2012 American Physical Society Tom W. Bonner Prize in Nuclear Physics. The citation reads: "For his foundational work in developing and applying nuclear Density Functional Theory, motivating experiments and interpreting their results, and implementing a comprehensive theoretical framework for the physics of exotic nuclei." Congratulations to Witek on this well-deserved recognition! Dr. Ionel Stetcu, a member of the UNEDF collaboration, has accepted a staff scientist position in the nuclear, particle, astrophysics and cosmology group in the Theoretical Division at Los Alamos National Lab. Ionel will work on a combination of nuclear theory and applications. Congratulations to Ionel on his new position! An article on The UNEDF Project highlighting the collaborative effort, the progess made, and the future prospects appears in the July, 2011 Nuclear Physics News from NUPECC. Dr. Pieter Maris has been appointed to the position of Research Associate Professor at Iowa State University effective July 1, 2011. Dr. Maris is one of the leaders of the LCCI project within UNEDF to create a Leadership Class Configuration Interaction (LCCI) code for nuclear physics. Congratulations to Pieter on his new position! Dr. George Fann, UNEDF collaboration member at Oak Ridge National Laboratory, is leader with Dr. Robert Harrison of the MADNESS ("Multiresolution Adaptive Numerical Environment for Scientific Simulations") software development team. Dr. Fann works with ORNL and University of Tennessee physicists in UNEDF applying MADNESS to develop a massively parallel adaptive three-dimensional DFT solver for nuclear density functionals. A press release with additional details can be found here and background on the R&D 100 Awards can be found here. Congratulations to George on this well-deserved award! Dr. Joaquin Drut, UNEDF collaboration member at Los Alamos National Laboratory, has accepted an Assistant Professor position at the University of North Carolina at Chapel Hill. He will continue as a Director's Fellow at LANL until the summer of 2012. Congratulations to Joaquin on his new position! A team led by UNEDF researcher Aurel Bulgac of the University of Washington has developed a computational framework that describes the superfluid dynamics of fermions. The June 10 issue of Science features a paper describing real-time evolution and interaction of quantized vortices based on the solution of up to hundreds of thousands of coupled nonlinear partial differential equations (see this blurb). Press releases from the University of Washington and PNNL have further details on the work and all the researchers. The research is also highlighted in Physics Today. Sofia Quaglioni of Lawrence Livermore National Laboratory was recently awarded a grant from the Department of Energy Office of Science Early Career Research Program (ECRP). Sofia is one of 65 ECRP recipients and she will use the grant to continue her research to achieve an accurate prediction of fusion reactions. Sofia has been partially supported by the UNEDF project over the past few years, working alongside Petr Navratil to derive and apply an ab initio framework to describe nucleon scattering on light nuclei. The list of Early Career award recipients may be found here and the Livermore press release may be found here. Congratulations to Sofia on this well-deserved award!